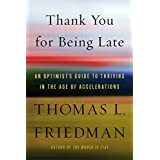 V I highly recommend this book, Thank You for Being Late: An Optimist's Guide to Thriving in the Age of Accelerations by Thomas Friedman. He talks about the accelerating rates of change in our lives. Change will keep coming faster and faster, affecting our homes and our workplaces. It is now coming at a rate which is faster than we can deal with. There are three major forces: technology, globalization, and climate change. In technology computer technology is able to do so many more things, more quickly and faster and more thoroughly and more cheaply than ever before. The global economy is now digital; we can get computerized robocalls from anywhere in the world. Climate change (which I have not finished so far) is also driving change. All three forces are working on each other. All these changes will mean many more changes are in store for us. Some of those will be highly beneficial; others are not so good. But they are affecting our politics (One candidate for president was basically able to bypass the media and communicate with millions by way of twitter, whether you like him or not.) The workplace will be changed. Maintenance people now work with laptops and ipads. We will need to develop stronger families and stronger communities where people will feel connected, protected, and respected if people are to do well in the future. There is a YouTube video of Friedman talking about his book. The whole video is almost an hour, but it is very good. I thought the Q and A (the last third or so of the video) was excellent. 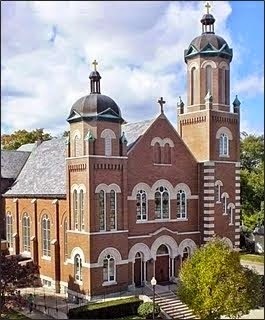 He also talks a bit about the role of churches, synagogues, and schools.